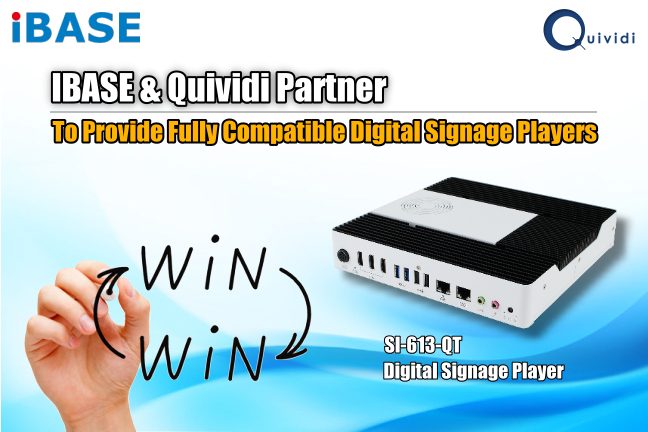 Taipei, Taiwan, January 30, 2018 - IBASE Technology Inc. (TPEx: 8050), a world leading manufacturer of embedded system and digital signage players, and Quividi, the industry standard for Audience Analytics in digital signage, announce their partnership to provide Quividi-compatible digital signage players. The IBASE SI-613-QT player has been officially tested by Quividi, ensuring its full capability of running Quividi’s VidiReports 6.x software in a single screen/ single camera mode, as well as in a dual screen/ dual camera mode. The SI-613-QT is a 3x 4K UHD digital signage player designed for digital menu boards and multi-screen video wall applications. Aside from supporting three independent ultra high-definition 4K-resolution displays, the product is powered by the latest 7th/6th Generation Intel® core™ processors and built with segregated flow ventilation to ensure that the circuit board is free from dust and contaminants. SI-613 comes with hardware EDID (extended display identification data) simulation that prevents screen convergence problems and issues due to cable disconnection or failure to identify EDID, erroneous settings in hardware or digital playback software settings. The system has iAMT (11.0), TPM 1.2, vPro and is integrated with IBASE's unique iSMART energy-saving and Observer monitoring technologies that feature automatic power on/off scheduling, automatic power recovery, low-temperature boot protection and hardware monitoring. Its slim chassis allows it to perfectly fit behind small spaces of the screen. For every screen and message, the system determines, in real time, the number of viewers, broken down by demographics (age, gender), facial attributes (glasses, beard) and mood, as well as the opportunities to see, and the viewers' attention time. Retailers and brands can also design customer-engaging experiences, by contextually triggering content against Quividi’s real-time analytics and benefit from Campaign Genius, Quividi’s new AI algorithm that dynamically optimizes creatives for the most impactful audience engagement. IBASE Technology (TPEx: 8050) is a reputable supplier specializing in the design and manufacturing of robust industrial PC products. Since its establishment in 2000, IBASE has been committed to the production of high quality products, and to the rendering of excellent services. IBASE carries out manufacturing and quality control at its own production sites in Taiwan that are certified to meet ISO 9001, ISO 13485 and ISO 14001 standards. Its current product offerings comprise of x86 and RISC based industrial motherboards, embedded systems, industrial panel PCs, digital signage players and network appliances for various applications in the automation, digital signage, gaming, transportation, smart building, medical, retail and networking markets. For more information, please visit www.ibase.com.tw. Created in 2006, Quividi is the industry standard for Audience and Attention Analytics in DOOH with over 500 end-customers and 1 Billion people analyzed every month in 50+ countries. Quividi’s computer-vision technology measures MRC-compliant viewability and views, which elevate DOOH to the most accountable digital medium available today. Its creative and marketing suite also enables campaign creation and optimization, based on context and audience engagement (demographics, mood, environment…).